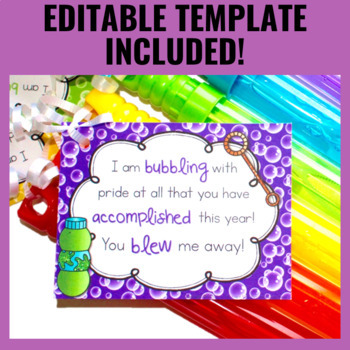 Celebrate the end of the school year with these bubble gifts for your students to tell them how proud you are of them! 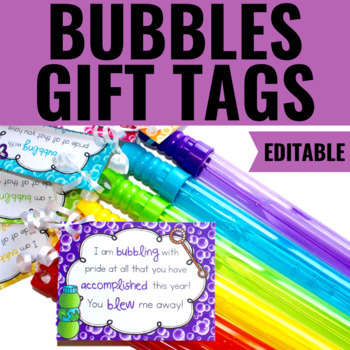 "I am bubbling with pride at all that you have accomplished this year! You blew me away!" "We are bubbling with pride at all that you have accomplished this year! You blew us away!" "Je pétille de fierté de tous tes accomplissements cette année. Tu es époustouflant!" "Je pétille de fierté de tous tes accomplissements cette année. Tu es époustouflante!" ...and are the perfect topper for a bottle or wand of bubble solution. 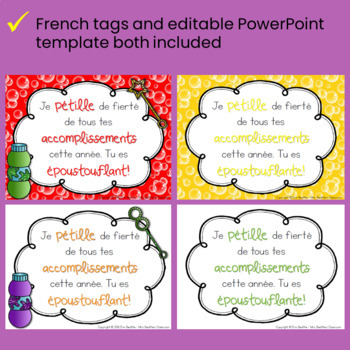 ❤️ Tags come in 8 colors, printer-friendly version, plus a black-and-white version that can be copied onto colored paper.